The ‘I’M The Change Talk Series’ hosts stalwarts who have made an exemplary contribution in the area of sustainability or towards bringing in positive social change. This Talk Series is a part of the ‘I’M The Change’ Initiative of IMT Ghaziabad on Sustainability and Social Responsibility (SSR). The initiative was launched on October 1, 2016, inspired by Mahatma Gandhi’s teaching ‘Be the change you want to see in the world‘ and also includes a mandatory 3-credit experiential learning course on SSR for the first year students of IMT Ghaziabad’s flagship two-year full-time PGDM. Setting the context, Dr Kasturi Das, Faculty-in-Charge, SSR said, “The I’M The Change Talk was conceived as an integral part of the SSR course to expose our students to real change-makers like Anshu ji so that our students feel inspired to do their bit for the society, and perhaps also to sow in them the seeds of becoming change-makers themselves, going forward!“. “The SSR Course is a unique pedagogical innovation that IMT has developed and implemented ground-up – something that has been vindicated when the ‘I’M The Change Initiative’ was recognised globally by the United Nation’s Principles for Responsible Management Education (PRME). All our social projects are in alignment with one or more of the 17 Sustainable Development Goals (SDGs) that the UN adopted in September 2015,” she added. Following which, it was a moving talk by Anshu Gupta where he touched upon a range of topics including misallocation of resources, government subsidies, alternative currencies, menstrual hygiene, and lack of drinking water and electricity among the urban poor, etc. 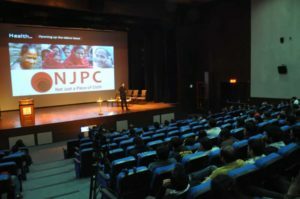 The celebrated social entrepreneur, in his hard-hitting talk, pulled no punches as he talked about the recent event of Kailash Satyarthi’s Nobel Prize getting stolen. He pointed out the gross misallocation of resources in the country as chandeliers in airports somehow rank higher on the policymakers list rather than clean drinking water at train stations. “One of the best airports in the world, the one in Mumbai, coexists with one of the largest slums in Asia– Dharavi,” he said. Himself, a student of a government subsidised college, Anshu Gupta stressed upon the need to give back to the society once one has reaped the benefits of a subsidised education. On the issue of farm subsidies, he questioned its economics as the real price of agricultural products would raise the prices out of reach of the common man. Hence, farm subsidies were more of a case of the farmers subsidising the produce for the common man rather than the government helping the farmers. Citing the alarmingly high number of farmer suicides, he stressed on the ineffectiveness of farm subsidies as an economic measure. He also talked about developing alternative currencies for development- labour, skill, time and material. He said, “Our initiative is that of creating a parallel economy – not cash based but trash based.” He was talking about the initiative called Cloth For Work started by ‘Goonj’, where villagers work on infrastructure projects providing skill and labour, and in return compensated with clothes and food grains. Sharing anecdotes and personal experiences, Anshu Gupta talked about clothing (lack of clothing) as an essential development goal in developmental agenda. And finally, in a country where menstruation is still a taboo subject, Anshu Gupta touched upon the topic of sanitary napkins. He pointed out the acute shortage of basic sanitation for women in the rural areas, where products such as carbonated drinks and biscuits could reach quickly. He urged the students to work, innovate and undertake projects on women’s sanitation as small steps could bring in massive changes in the field. Today, IMTG is the proud alma mater of more than 300 C-suite executives and thousands of professionals serving in leadership positions in the best-known organisations in India and the world, in key business functions of sales, operations, human resources, consulting, information technology, marketing, and finance among others. For more information, visit: https://www.imt.edu.